From the Elvis Presley collection by Aquarius. Million Dollar Quartet Boxed Mug. This Item is in stock and ready to ship. You should not postpone your purchase and miss out on adding Million Dollar Quartet Boxed Mug to your Elvis Presley collection! From the Elvis Presley collection by Aquarius. 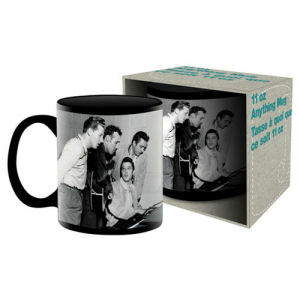 Million Dollar Quartet Boxed Mug. The famous image of Elvis Presley - Jerry Lee Lewis - Johnny Cash - Carl Perkins on a coffee mug. Hand wash only. Not dishwasher safe. Do not microwave. Aquarius Elvis Presley Coffee Mugs shipping from Canada. No Surprise Border fees or Customs!